Last night, as I have been doing lately in both the evenings and mornings, I was trawling the bands with a SoftRock (a dual-band v6.0 built for 40 and 80 meters—my first SoftRock) and Rocky. Without fail, the waterfall enables me to see something interesting, which brings me to the point that I really need to integrate these receivers into my station. But, I digress. The really tantalizing, fascinating signals are the weak ones, especially when they are weak and unusual. 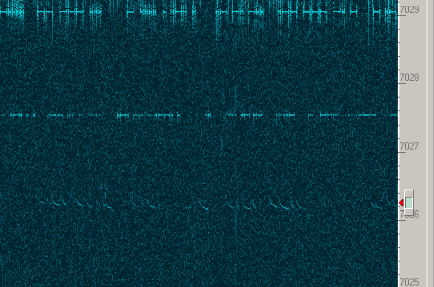 The subject weak and unusual signal is shown in the figure headlining this post. Rocky’s cursor shows the approximate bandwidth of the CW filter (250 Hz, if I recall correctly) and the center frequency (7026.25 MHz). I tuned it in and caught a CQ from “AA1T…” Recalling that I head read about Mike, AA1TJ‘s, Das DereLicht transmitter built mostly from parts scavenged from a dead CFL, I suspected it was him. After a moment the QSB came up and I caught the ‘J.’ Thanks to the fact that the SDR is not fully integrated into the station, I scrambled to plug my 15-year-old Small Wonder SW-40 in and get it online. Mid-scramble, Sarah handed Evan off to me for a diaper change, but I did manage to snap the screenshot above. By the time I returned to the shack awhile later to close things down, AA1TJ had disappeared. Through the (ubiquitous) magic of the Internet, I sent Mike an apologetic e-mail QSL, which yielded a nice response. It turns out that he was trying a 40-meter version of the first transistor transmitter described in the amateur literature. The design for 146 MHz by K2AH appears in March 1953 QST. If you are an ARRL member, pull up those old QSTs in the archives and read about it. K2AH is on the cover of February 1953 QST with the same transmitter. Mike figures he was making 20 mW, or 20650 miles/Watt on the path from his station to mine. The more remarkable thing is that he was using a 1956-era point-contact transistor (the same type as in the K2AH article). Fascinating stuff! Hopefully, we’ll connect for a real over-the-air QSO sometime soon. Thanks, Mike, for making my day by doing something interesting and sharing it on the air!